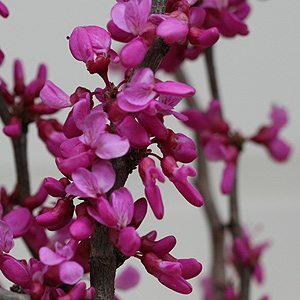 This attractive spring flowering tree is from the Mediterranean and Cercis siliquastrum is known as ‘The Judas Tree’ or ‘Tree of Love’. Masses of deep pink flowers in spring and it is tough, drought tolerant and capable of growing in poor soils. Perhaps the foliage of Cercis siliquastrum, although heart shaped as with other species, is not as attractive as its highly promoted relatives, however in warmer areas and in full sun it is probably a better choice. Foliage is coarse and leathery, turning from bronze to green and then to a buttery yellow in autumn. Widely used in parks and gardens across Australia and Cercis siliquastrum is often found in older gardens where its hardy nature was appreciated. Useful at the back of the garden border where its spring color provides a real lift. Not as fussy about soil and climate as other Cercis species, C. siliquastrum will grow well in full sun and in poor soil. It will reach around 10m in height over time with a spread of 5m and requires very little additional care once established. Some gardeners do elect to prune to keep a more ‘compact’ bushy shape, however remember that this is a slow growing species.